INSIDE a warehouse in industrial southeast London, farmed tilapia swim in blue tubs filled with pristine water, ready to be sold to trendy restaurants across the capital. Salad leaves, herbs and leafy greens grow inside a warehouse run by GrowUp Urban Farms, the first commercial aquaponic farm in the UK, which farms fish and uses the waste to fertilize crops in London. 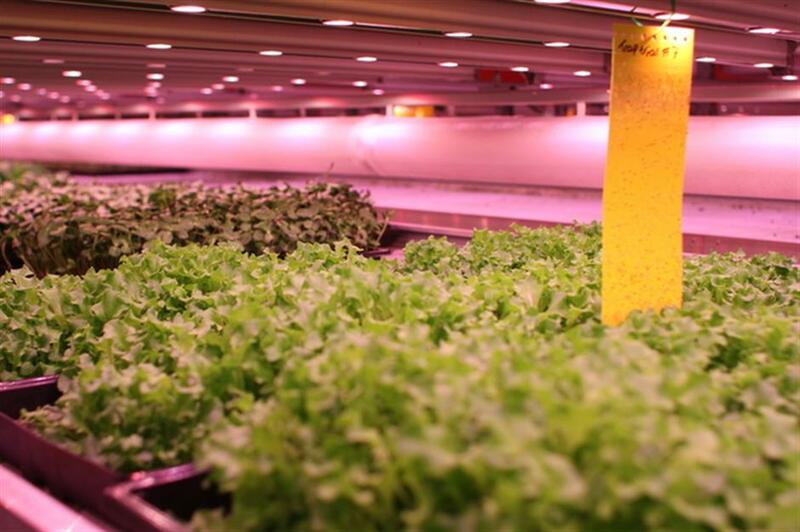 In an adjacent room, under pink LED lights and controlled temperatures, shoots of salad leaves and herbs grow on recycled carpet fibre fertilized with the fish waste. In this cavernous, windowless space more suited to a nightclub than a farm, the greens are stacked on metal shelves stretching to the ceiling. It’s a far cry from traditional British farms that sprawl across acres of land. But for Kate Hofman, who co-founded GrowUp Urban Farms in 2013, producing food in this 6,000 square feet building in Beckton was not only clever and cost-effective, it was also a sustainable way to feed people in the city. “Sometimes people have an idealized idea of how their food is being produced. In their head, they think that farmer Joe tends to his field with his hoe and grows his heads of lettuce,” the 32-year-old said. “We’re trying to show that you can have an industrialized food system ... but you can do it in a way that’s sustainable,” said Hofman, who launched Britain’s first commercial aquaponic farm — a system that uses fish waste to fertilize crops, which in turn filtrate the water used to farm the fish. Rich and poor countries alike are tasked with creating sustainable and inclusive cities by 2030 under global development goals agreed in 2015 — and sorting out how cities are fed is a crucial part of that challenge, experts say. As two-thirds of the global population are forecast to live in cities by 2050, compared with about half now, urban planners and policymakers are increasingly looking to agriculture in towns and cities as a solution to provide nutritious food. Land used for farming in cities and the areas around them equals the size of the European Union, a recent study said, while others estimate some 800 million urban farmers provide up to 20 percent of the world’s food. Unlike imported produce, food from city farms and gardens travels less, reducing production costs, waste and fuel use. “Because (urban farms) are in proximity to an urban population, they can see for themselves where their food is coming from. This has a benefit in terms of education and reconnecting food with the consumer,” said Makiko Taguchi, an urban agricultural expert at UN Food and Agricultural Organization. Having your food come from sources close by is also crucial if supply is disrupted by civil unrest or extreme weather in the rural areas that still supply most of the world’s food. Hofman said Britain’s huge appetite for salad leaves and herbs, and the fact that most of it is imported, were key reasons why she decided to grow such plants in her warehouse. “It makes sense to grow crops like these close to people so you can get it to consumers more quickly — they’re fresher, they last longer in the fridge, they’re less likely to go to waste,” said Hofman, who sells 200,000 bags of salad each year to local food retailers and restaurants. Hofman also sells 4 tons of fish each year and believes the ethical farming of fish provides a sustainable source of protein, especially at a time when nearly 800 million people worldwide do not have enough to eat, according to FAO. Though Hofman doesn’t think urban farming could ever replace existing food production systems, she hopes to pioneer ways to scale up the output of urban farms. “It’s terrifying. There’s so much unknown in the model that we’re trying to do. There are so many challenges that we’re trying to overcome,” Hofman said.